A former senior drug policy advisor to President Barrack Obama came to the Putnam Hospital Center in Carmel on April 5 to express his strong opposition to the legalization of the recreational use of marijuana. 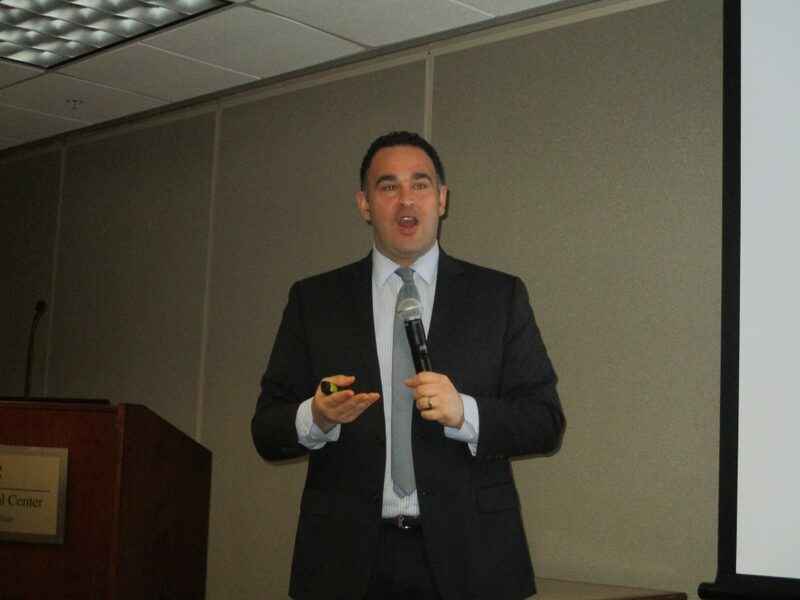 Dr. Kevin Sabet, former senior drug policy advisor to Obama, addressed The Prevention Council of Putnam and the Putnam Communities That Care Coalition’s fifth annual conference. The conference’s theme was the costs of implementing the legalization of marijuana with the health, safety and social concerns. Sabet is president of Smart Approaches to Marijuana New York, a nonpartisan alliance of lawmakers, scientists and other concerned citizens, co-founded by former Congressman Patrick Kennedy. SAM New York is comprised of medical doctors, health professionals, teachers, drug treatment workers, prevention advocates, parents, and other concerned citizens. “We want to move beyond simplistic discussions of ‘incarceration versus legalization’ when discussing marijuana use and instead focus on practical changes in marijuana policy that neither demonize users nor legalizes the drug,” the group’s website stated. The New York State Legislature is considering legislation to legalize recreational use of marijuana. Gov. Andrew Cuomo originally sought to have the legislation included the 2019-20 state budget, but it was taken out of the budget talks. Sabet, who was also a member of the administrations of President Bill Clinton and President George W. Bush, said not only has marijuana legalization not provided the benefits proponents said would come about, there have been many negative impacts. Sabet said his organization has been lobbying against the legalization effort in the Empire State. “New York is a priority for us,” he said. The group’s efforts have been backed up by many in the state including major health care organizations and PTAs, he said. Sabet compared the current environment of the push for marijuana legalization to one century ago when cigarettes were being promoted as a big business. “I feel we’re back in 1919 not 2019,” he said. Tobacco had been used for thousands of years but they began to become harmful to health with the addition of nicotine in the 20th century, he said. Large companies such as the makers of Marlboro cigarettes and Corona beer are investing in the marijuana business, Sabet said. The marijuana industry has received $1.8 million from “Big Tobacco,” he said. Many people describe marijuana as safe, Sabet said. “It’s just a plant. It’s natural,” Sabet said is the opinion of many youths and parents, but that is not correct. Marijuana use has potential harmful effects on the brain, which develops until the age of 30, Sabet said. Today’s marijuana has a much stronger concentration THC (Tetrahydrocannabinol) than the drug had in the Woodstock generation, making it more harmful, he said. Though marijuana is legal in eight states, which came about through public referendums, its use is still illegal for youths in those states, Sabet said. In Colorado, in which marijuana is legal, the number one reason for the arrest of high school students in the state, according to a recent study, is marijuana possession and use, he said. Electronic cigarettes are a vehicle for the smoking of marijuana by youths, Sabet said. Sabet said his organization favors decriminalization of marijuana rather than legalization. The group is not seeking to have harsh prison sentences imposed on users, he said. Some forms of medical marijuana have been available in the area for years if a person obtains a doctor’s prescription, Sabet said. Though proponents of legalization of marijuana have advocated it as a way to reduce the unequal treatment of minorities caught with the drug, there is still a significant disparity in the number of non-whites being arrested for possession as compared to white people, he said. Social justice for non-white marijuana users could be achieved decriminalization of the substance rather than legalization, he said. Recreational marijuana uses are not legal under federal laws, which regulate interstate trade, and the federal government could go after states that have legalized if they chose to do so, Sabet said. The revenue generated by the taxation of marijuana has been estimated to be up to $300 million annually, according to Cuomo. But $300 million is only a small fraction of revenues in the state budget, Sabet said.